Some consumers who love the BlackBerry Priv, are turned off by the $699 price tag that the manufacturer affixed to the phone. But good news might be coming in the form of a price cut. That comes directly from the company's CEO, John Chen. As we told you on Friday, BlackBerry delivered a better than expected third quarter earnings report as it spilled less red ink than expected. The company sold 700,000 handsets in the period, lower than expected. Priv sales were not broken out of the total. During the conference call that followed the release of the earnings report, John Chen made a comment that should warm the hearts (and wallets) of potential Priv buyers. In response to a question posed by RBC Capital Markets analyst Paul Treiber about the pricing and margins expected from the Priv during its life cycle, Chen gave a response that clearly indicated that a price cut for the company's Android slider is on the way. In fact, the CEO even gave us a good idea when to expect BlackBerry to take a whack at the device's price tag. According to Chen's response, we can expect the Priv to be cut in price around the time of the MWC show in Barcelona. The expo will be held from February 22nd to the 25th. Chen noted that some competitors will be introducing new handsets around the show. He did hint that BlackBerry might be unveiling a "mid-life kicker" that will be introduced for the Priv at that time, but still seemed to be resigned to the fact that a price cut would be necessary around MWC. One of the phones that we expect to see unveiled around this time is the Samsung Galaxy S7. Samsung is holding an Unpacked event on February 21st, the day before MWC opens, and the company's new flagship will most likely be introduced at that time. "Good question. So we have a model obviously, of pricing. I think the pricing will hold pretty strong for the next quarter in Q4. We already have seen some of the POs coming in. Especially in new introductions, margin is usually pretty strong. But I'm not -- but you all know the market very well. 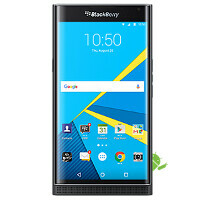 If the high price of the BlackBerry Priv is stopping you from purchasing the handset, be patient. It does appear that a price cut will be taking place in a couple of months. Impressed by the price cut. If it goes down to 450 bucks, I'm all over it! But will they? For 450, LG G4 says hello! Unlikely, I'd say it'll be dropped to 500 at most. 550 seems more likely. He must do that.. Many great and probably better choices are coming this upcoming year. I'm a little surprised they started it that high to begin with. That's higher than iPhone's start. I think they would have been wise to start at 600, and back off to 500 after 3 months. That way you bring in some extra from the early adopters. 14545, for 700, I'll take the Priv over the 650 16GB iPhone 6s anyday, because 6s got no 32GB version, and the 64GB version is way more expensive than the Priv's start. Agree with you as well. For what it brings to the table, I'd take the Priv as well. Hex, don't get me wrong. I fully agree with you. But I would never own an iProduct to begin with. I'm just saying with expectations it was priced to high above the competition to begin with. Not for what it does though. Keep in mind, I'm not saying the perception is right, just that you have to sometimes take an initial loss to win back your customers. Loss leaders exist for a reason. If they had priced it out of the gate at 500, even with a potential write-down, it likely would have been a bigger hit than it is now. I still think the Priv could save the company. JMO, though. That JMO though. Anyone that knows about technology knows the phone is worth every cent and not a dime less. Your theory was tried already with previous models such as jakarta amongst others. Blackberry needs to make money, what kind of move is to make a phone and sell it for a loss? Wtf?! I get what you are saying, but this phone is a major change in philosophy for them. Also, even at 500, I don't really see them taking a loss. I could be wrong, and have been in the past. But right now they need something big to change perception. Just like how Apple, rightly or wrongly, has the perception of being "perfect" and "saint-like". It seems like that crowd is who BB is attempting to woo, as well as pulling in some much needed android share, so give them more of a reason to try it. One more thing, and I am not saying they should have rushed, and put out an awful product, but they really should have done a better job of ensuring adequate supply for the holiday season, and they should have also done everything they could to get it on every carriers shelves for the holiday season. As it should have a price cut. As stated before this is not a 700 phone. It's an amazing 500 phone though. This news should definitely quiet down those that have complained about Priv pricing, but I really don't see them (at least not the ones on this site that complained, for the most part) buying the Priv, even with the price cut. I finally picked up the Priv over the weekend, and while I wish the build quality matched that of the BlackBerry Passport, I must say that I am enjoying my purchase. Meanest, have you figured out how to play youtube on the background? You'll need root and XPosed for that...there's an XPosed module precisely for that use. supposedly the Priv is unrootable. Downphoenix is correct. The Priv was designed so it cannot be rooted. No, I haven't. That's a "fault" of the Android OS, I believe. You need a YouTube Red subscription I'm order to do that. It's $9.99/month. If you already have a Play Music subscription or get one, the YouTube Red subscription automatically comes with it. Cool! Wasn't aware of that. Thanks, BobbyD. BB10 users are used to just playing YouTube in the background as they perform other tasks with their handsets due to BB10's multitasking capabilities. You will need a Google Music/YouTube Red account for that functionality. Out of curiosity I know with Google Chrome, you can simply exit the browser while a song is playing and then flick up on the quick settings and keep playing a song, even in the background, on iOS. Can this be a workaround for Android, as well? Given all the reviews, I'd much rather go with the Moto X Pure that started off much reasonably priced and got much better reviews...then again, I still really want BlackBerry's pop-up widgets feature. The pop-up widget feature is very nice. You can actually switch the apps that appear out of the box for the pop-up widgets, all except for Google search. It will just get a 50.- price cut. By February this phone will be considered old. That's how fast phones depreciate nowadays. This is exactly how an idiot works. Now no one will buy a Priv until february and then they will cry again next month how sales have dipped. If they want to give it a price cut they should not announce when they want to do. This is exactly why manufacturers do not announce new devices or machinery like cars or bikes before hand. They announce it only after reducing inventories and catch the market and their prospective customers and competition off-guard. You're absolutely wrong about that. People that want a Priv now will buy one now. Especially with new carrier partners coming on by the beginning of January. Even if they move less inventory due to the current prices tag, they will still make money as the asp will higher. That was evident in their ER that was just reported. Everyone will be slashing prices after the holiday season, as they will be bringing out new handsets.